Our kitchen cabinets are finally complete! And I couldn’t be happier. Our kitchen is so much brighter and fresh looking. We still have some more projects (granite counter tops, new back splash, new sink and faucet, and painting the walls) but it’s a start! The paint is Simply White by Benjamin Moore. We hired someone to paint them for us…and since I’m 9 months pregnant it was worth every penny! We also got all new cabinet pulls from Lowe’s that I love. I think the walls might look good painted a greenish, blue color, but haven’t decided yet. I can’t wait for my kitchen to be done! If you are thinking of going white, go for it! They look awesome! Love the hardware you chose! I love the white cabinets. They look really great. Love it and can't believe how different it looks…especially with your touches of black and red! Enjoy! Looks great!!! We need to get on this too! Love the white! I liked your kitchen before… I LOVE it now! These look awesome! We have white cabinets too, and when we first moved into our house I wasn't sure how I felt about them. Now I feel like it's the best way to go. 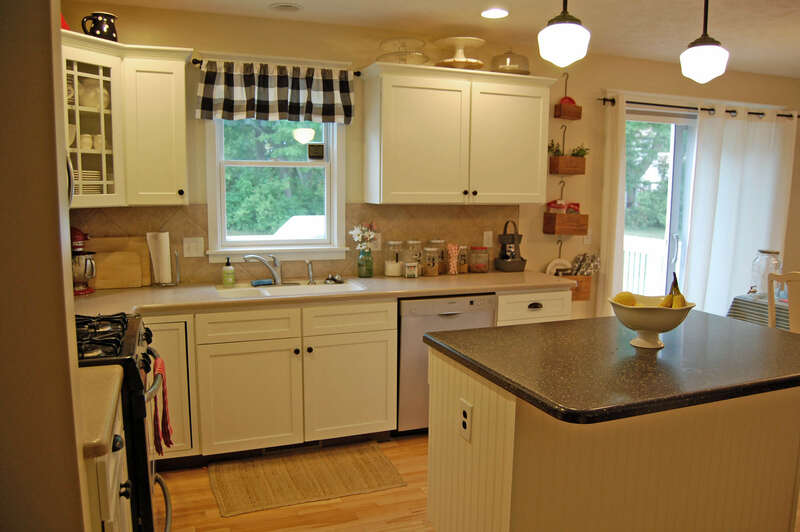 Love the cabinets… they look great!!! Gorgeous! It makes all of your little accents pop so much! I agree – I'm a huge fan of the white cabinets. They look beautiful!! The hardware is perfect too. Your kitchen looks so fresh and new now. OMG! LOVE IT!!!!!!!!!!!! So cute!! I love the idea of a greenish blue wall too! I think it'll look amazing! Looks great! Amazing what a little paint and some time can do! What a difference! They look great!! 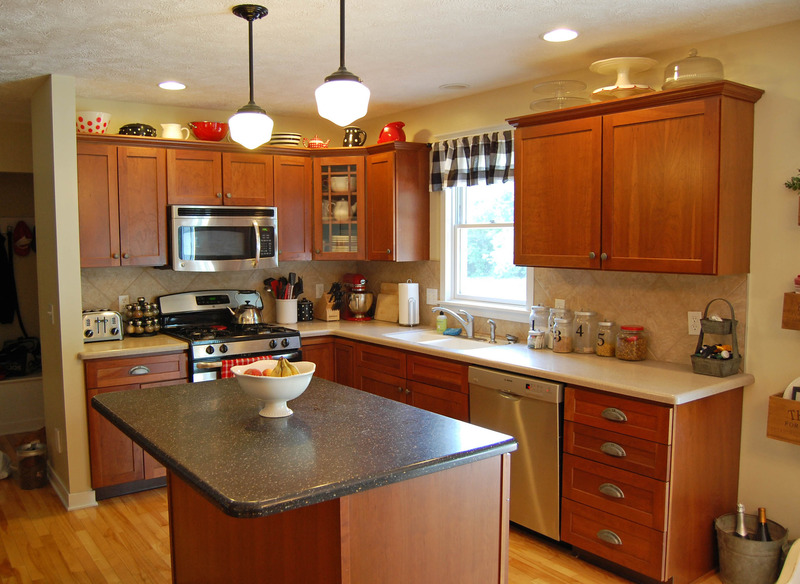 Your cabinets look great! I love white cabinets! I adore white kitchens. I think my husband would faint if I suggested ours getting a white coat since they are only 2 years old. It looks awesome! I LOVE the cabinets! They look great..so fresh and clean! Awesome job! Also- I wanted to ask if you made/purchased those hanging boxes near your back door? They are super cute– what all do you keep in them?! It looks amazing! 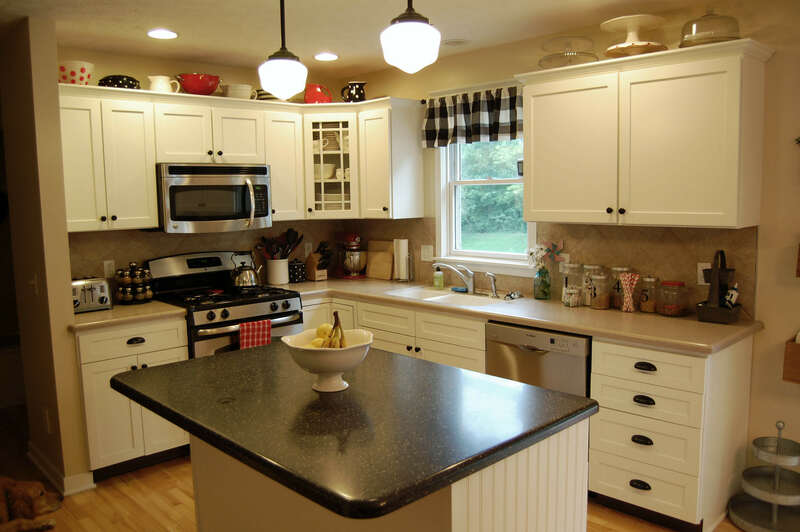 I love the white cabinets; it really brightens up the whole kitchen! I'm so glad you posted this! 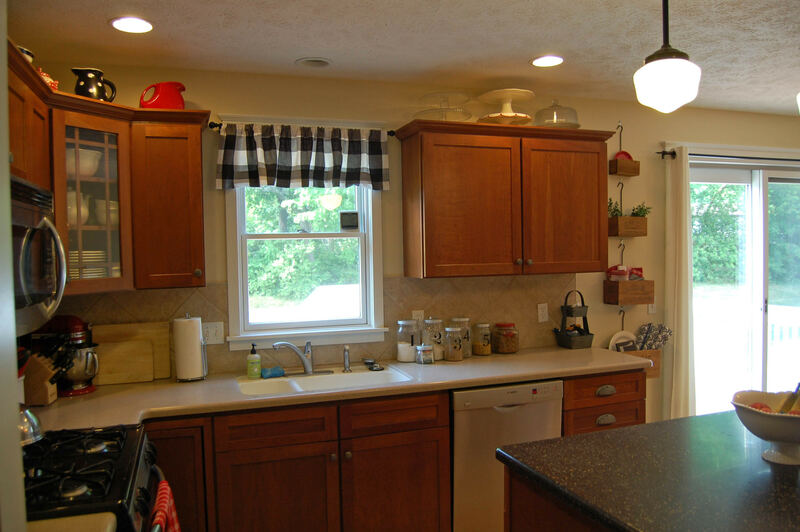 We have very dark brown (almost black) kitchen cabinets…thank you 70's original decor, haha, and I've been planning in my mind whether to paint or just get new. I'm thinking painting may be the route to go! However I would also want to hire someone. Do you mind me asking what the labor costs were for the painter? Obviously you bought the paint….but I just know my skills wouldn't be nearly as good as a professional! OHHHH MYYYYY GOOOOOSHHH, your kitchen looks ahh-maazing. Normal pregnant momma's get a nursery together in 9 months, but rock star momma's knock out the nursery AND a kitchen re-do! I love the white, it was definitely the right choice! Hey you "Soon-to-Be-Grandma" BEV! Where have you been? Dang! It looks SOOO GREAT! I adore white kitchens. That was a requirement when we were house shopping! So glad I found your blog! PS Your hair is Stunning! I LOVE the white cabinets! we've started looking at houses and anywhere I move I will have white cabinets. looks fantastic! WOW! 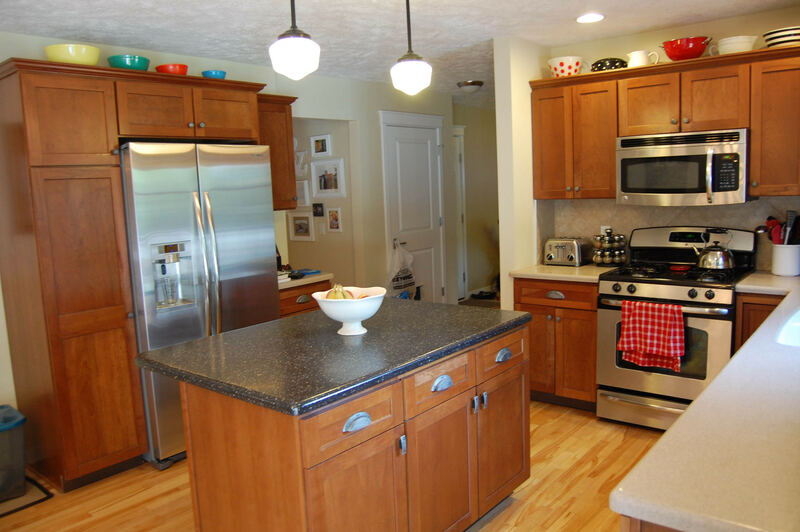 Your kitchen was cute before but now it is awesome! I looks so much bigger too!!! Wow! It turned out so great. I can't wait for us to do the same thing in our kitchen. 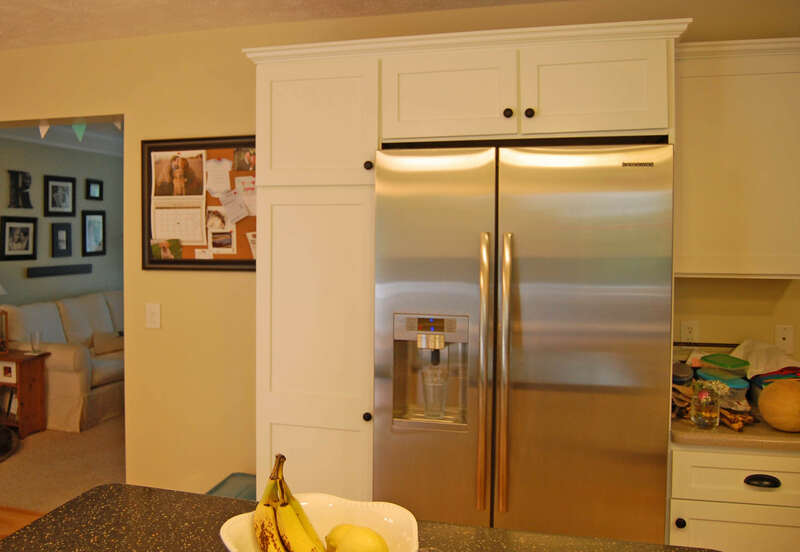 Painting your cabinets just gives it that extra oomph! I love it! And the granite is gorgeous! That was my number one project in our house as well – we had too much oak for our taste.